Today I thought I’d do an update on how I’m doing with the Gelatin Challenge and also answer some questions many of you are asking. If you haven’t read about the Gelatin challenge, you can read about it here! I ran out of bones last week so we used powdered gelatin rather than bone broth most of the week. I like to add a few tablespoons of gelatin to my coffee in the morning and I usually add some to my daily smoothie or Orange Julius. 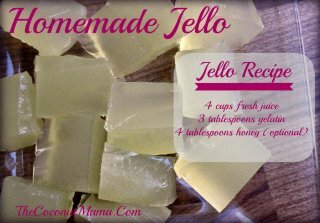 I’ve been making large batches of Jello and chocolate gelatin bars for the kids to snack on as well. I’m ordering beef bones today, so I will be enjoying a lot of beef broth later in the week. My kids love to drink bone broth. One of my daughters favorite soups is made with bone broth and pasture raised eggs. This soup is really easy to make and super healthy too! Q. Where do you purchase gelatin made from grass-fed cows? Q. I’m a vegan. Can you recommend a product that has some of the health benefits of gelatin that is not made from animal products? A. Nutritional yeast is high in B-Vitamins and has 4 grams of protein per serving (1 tablespoon). This is the best whole food supplement I could think of that is high in protein like gelatin. You can find quality nutritional yeast . gelatin rich broth! Want to make beef bone broth? Try from The Nourishing Cook! Q. Do you know how to make homemade gelatin powder? A. My mother in law just told me the other night that she found a recipe for making gelatin powder in the book, by Carla Emery. Wouldn’t that be a fun blog tutorial? I may have to look more into this and see if I can make my own gelatin! Q. 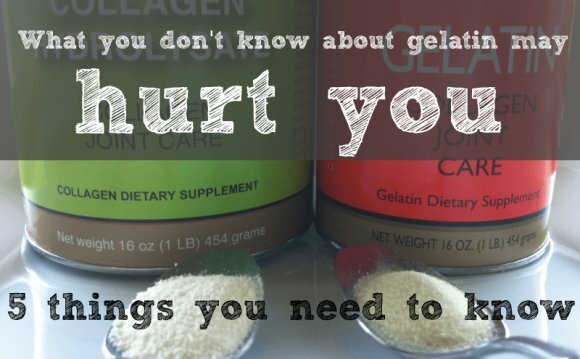 What is the difference between regular gelatin and hydrolysate gelatin? A. Hydrolysate gelatin is cold water-soluble. You can add it to smoothies and drinks without dissolving it in hot water. It will not gel up like regular gelatin does. Q. I want to add gelatin to my smoothies instead of protein powder. The only problem is that my smoothie gets really chunky when I use gelatin. Do you know how I can use gelatin in my smoothies without it thickening my smoothie? A. It helps if you dissolve the gelatin in warm water before adding it to your smoothie. If you let your smoothie sit too long it will thicken from the gelatin. It’s best to drink it up fast or to use in your smoothies instead. If you have more questions please leave a comment below and I will do my best to answer them! 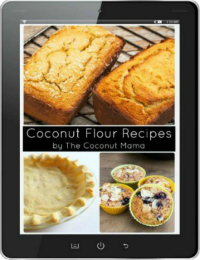 Subscribe for instant access to my free ebook, Coconut Flour Recipes. I'll also send you free weekly recipes and wellness tips.